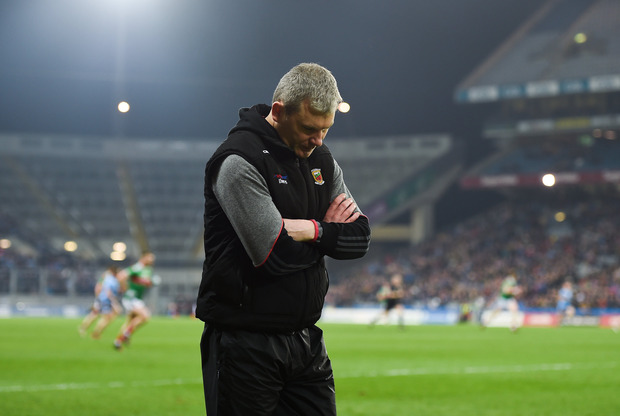 Peter Canavan says that Mayo's defeat to Dublin last weekend might not be the worst thing for James Horan in his second spell in charge despite a chastening loss to the All-Ireland champions. Mayo travelled to Croke Park with three National League wins from three and had an opportunity to all but end Dublin's hope of a seventh straight league final appearance. However, Dublin eased to a 1-12 to 0-7 win at GAA HQ, and the margin of victory could have been far greater had Mayo goalkeeper Robbie Hennelly not produced a number of top saves to keep Jim Gavin's side at bay. Despite missing out on the psychological boost of beating Dublin for the first time under Jim Gavin, Peter Canavan thinks that the result might not be the worst thing for Mayo in the long run. Speaking on The Throw-In, Independent.ie's GAA podcast, Canavan said had Mayo taken down Dublin, the hype may have become a distraction as James Horan tries to prepare his side for a championship assault. "From a Mayo perspective, I would have thought that Mayo could have had a real problem if they had won on Saturday night," Canavan said. "You can just imagine the euphoria down in Mayo and the hype that goes with them and the 'this is going to be their year'. They were in a good position in the league coming into it. Things were going really well so this is a reality check. It will bring their feet back to ground again. "They aren't the first team to go up against Dublin and fail to perform. James has plenty to work on but I don't think he will be reading too much into it." One part of the defeat that will have annoyed Horan is how his young forwards failed to fire. Brian Reape, Ciaran Treacy and Fionn McDonagh kicked 0-1 from play between them after impressing in the opening three games. Canavan said that the youngsters should be given more time to settle into the team - but expressed his concern around the amount of new blood in the Mayo panel. "That was disappointing," Canavan said of the trio's performance. "I would have thought James taking over Mayo was a massive gamble because I didn't see anything different in the team to what he had a few years back. Galway, Donegal, Tyrone and Kerry, all the other contenders, they all have exciting newcomers. Mayo, you couldn't say the same. He has unearthed a couple of lads up front but when you were looking to see how well they could play in Croke Park, it was disappointing. "We'll give them a pardon this time around but James will certainly want them to be delivering from here on."